The handwriting guide series Hatera Lekha, হাতের লেখা, teaches children to write in the cursive, flowing Bengali script with dotted guidelines. This is the inside front cover of the booklet – it looks as if perhaps teachers, authors, or handwriting experts have all signed their names? They all begin with “shree”, an honorific title. The text below I believe reads “scholars” of Hatera Lekha”.. and something about handwriting being one-of-a-kind..
After learning Devanagari primarily from typefaces, I was surprised to see how different handwritten Bengali looks from the typeface form. 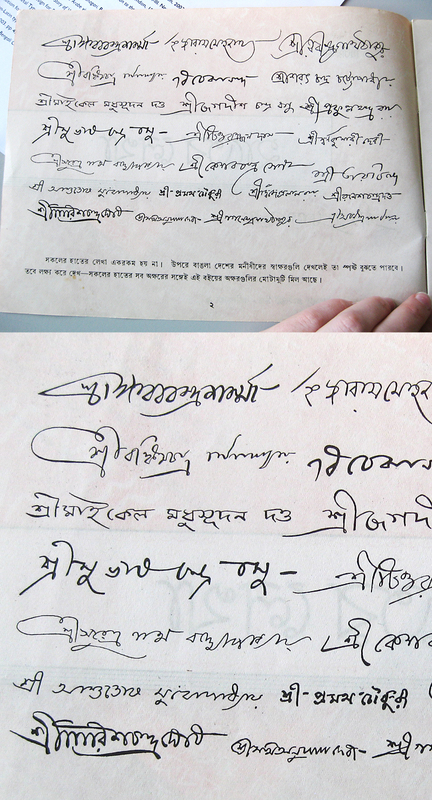 I absolutely love handwritten Bengali. Actually, these are the signatures of famous Bengalis, including Rabindranath Tagore, Michael Madhusudan Dutt, Ashutosh Mukherjee, Jagadish Chandra Bose, and Sarat Chandra Chattopadhyay. The list includes writers, scientists, and political revolutionaries.